If you trust the supply chain, open or gaping mussels before cooking probably just means they’re still alive and breathing – don’t worry, they won’t bite. Closed mussels after cooking could be that the mussel’s muscle didn’t relax, or was pushed closed during cooking. This doesn’t mean that these mussels can’t be served. Before discarding, test by comparing them to the others on smell, colour and texture (sensory). Fresh mussels will smell like the ocean, not like fish. Squeeze or tap fresh mussels to see if they close; cooked mussels can be set aside and forced open to compare. Live vs. chilled vs. frozen? Live mussels are still breathing when sold. They stay alive for around four days after harvesting if handled correctly. Chilled mussels can still be used if you trust the supply chain and you’ve done a “sensory test”. Frozen mussels are partially cooked, so thaw completely and add to cooking process later than live or chilled mussels. Mussels taste best when cooked at high heat for short periods of time to prevent them shrinking and becoming chewy. Colloquially, mussels are called Black Mussels due to their shell colour. However, the Mytius Gaoprovincia – commonly known as the Mediterranean or Spanish Mussel – is used for farming in South Africa. This species can be distinguished by the colour of the meat, with males being white or creamy in colour and the females orange. South Africa also has its own indigenous Black Mussel species, Choromytius Meridiona, which naturally settles on the ropes during the farming process. These can be distinguished by the black or blue colour of the meat. Both species share all the same benefits and taste very similar, with only their appearance being different. 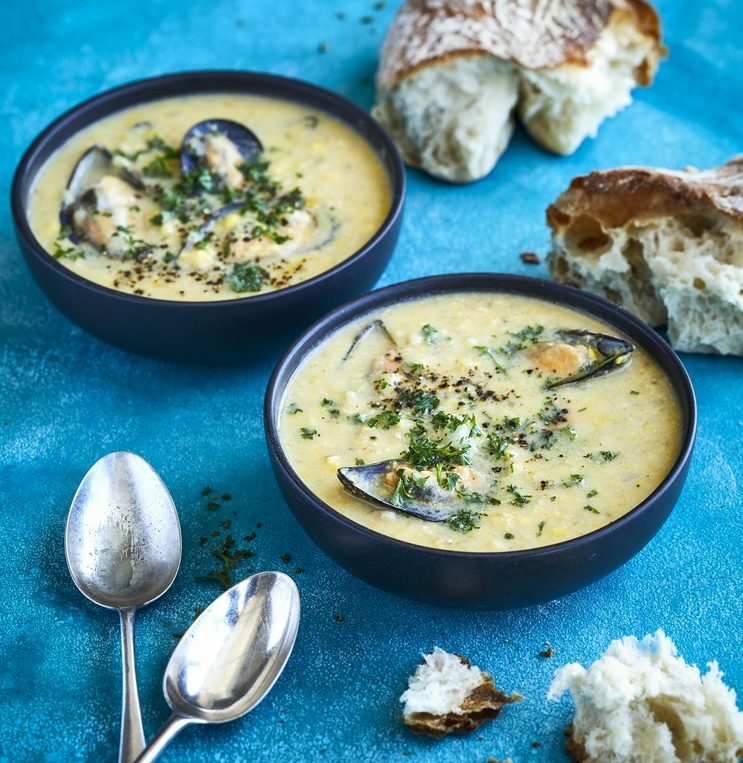 Local mussels taste great throughout the year, but are at their best during the cold winter months. It’s a great time to preserve them for the summer, as they are bigger and juicier, filling the shell to the brim. In the warmer months, spawning can occur (normally around September and December), which reduces the size of the mussel’s meat and may lead to an unfamiliar smell. But don’t fret, simply rinse them off as they are still good to eat. It’s important to buy mussels from a reputable supplier, as red tide is a yearly occurrence. Blue Ocean Mussels is part of the Molluscan Shellfish Monitoring and Control Programme, which ensures that no mussels are harvested or consumed during (live/fresh) or from this period (frozen). In other words, you can always enjoy the mussels with peace of mind. The beard: take it away, boys! The byssus – better known as the beard – is what the mussel uses to attach itself to rocks and ropes. It’s a filament like substance that hardens in the water and is used by the mussel to attach to objects (a beard at such a young age…pretty impressive, don’t you think?). Although completely harmless and can be left in the cooking process, it can be tough, visually unappealing or leave residue in the natural broth that needs to be strained. Removing it, however, is a quick and simple process. To avoid teary eyes when slicing the onions, pop them in the freezer (the onions, not your eyes) for about 20 minutes before you begin. Super cold onions are much slower to release those tear-jerker fumes. Heat the olive oil in a large saucepan over medium-low heat, add the bacon, onion, celery and chilli, and sweat for 5 minutes – until soft, not browned. Bring to the boil and simmer gently for 10 minutes, or until the potatoes are soft. Bring to the boil and cook for a few minutes until the mussels have opened. If using local frozen half-shell mussels, add now and cook for 1-2 minutes.